We were given a sneak peek in 2017, but Apple's AirPower still hasn't seen the light of day. With nothing forthcoming from Apple, has it been canceled or delayed? September 14 2017, was the day Apple introduced us to its then-new iPhone 8/8 Plus, and who can forget the Phone X and with them an overdue feature arrived - wireless charging. 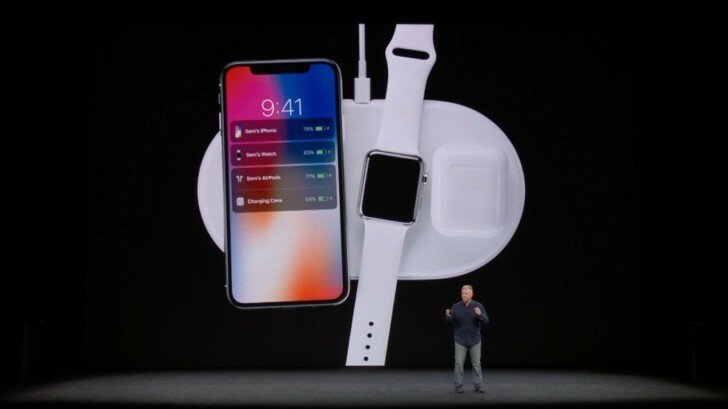 Apple also took the opportunity to give a ‘sneak peek’ at a new product - the AirPower Mat, capable of charging up to three iDevices simultaneously, and with a typical Apple flourish the devices would communicate with each other. Thus a charging iPhone would also display the charging status of any other devices that were being topped up alongside it. In typical Apple fashion it was an elegant and sleek solution, journalists were even given hands-on time following the first event in the Steve Jobs Theater. All things indicated that a launch wasn't far off. Maybe. Before we dive into any more detail, let’s recap quickly how wireless charging works. Apple adopted the Qi wireless charging standard for its iPhone and Watch products. Qi (the Chinese word for “energy flow,“ pronounced like the “chee“ in “cheese“) is a universal standard, with the latest implementation supporting 15W charging, twice the currently supported by Apple. Simply put, electromagnetic induction is facilitated by a transmitter and receiver coils being aligned to generate an electromagnetic field between the two devices. It's this electromagnetic field that moves the electrons in the receiver coil and charges your devices battery. The alignment between the transmitter and receiver coils, in a single coil design, is relatively precise. In my non-scientific tests, an iPhone has roughly a 10mm tolerance on a Samsung charging pad - move outside of that, and the 'connection' is lost. It's in Apple's DNA, where possible, to make every one of its products/services -' just work.' One of the issues that Apple faced was how it would get around a user having to precisely align each device on a multi-device solution. In our examples below, the most natural and cost-effective solution would be to have three coils, one for each device - but this is precisely the issue that Apple wanted to solve. Leave this one for the knock-off products. Industry insiders have predicted that the approach undertaken by Apple was to use a free position coil array. This shotgun approach utilizes many overlapping coils, sometimes of differing size, to ensure that no matter where a device is placed it's highly likely that it's aligned. While each issue on its own is not insurmountable, bring them all together, and it's entirely possible that the overall solution lacked the engineering and design elegance that Apple requires of its products. Given the complete removal of AirPower from apple.com, it’s clear that, at best, Apple isn’t confident that it will be ready to launch AirPower anytime in the foreseeable future. The 2018 iPhone's include reference to AirPower in their printed User Guides, indicating that it was a recent decision to remove AirPower from its marketing materials - while too late and costly to re-print/package the aforementioned guides. All said and done - while elegant, this product was never going to change the world. And given the challenges, Tim Cook may have decided that the future return on investment makes this product unviable. Current speculation is that Apple may resurrect the AirPower brand for an unrelated implementation. Apple has several patents that identify how you could use one Apple product to charge another - for example, charging your iPhone from a MacBook Pro. Let’s end on a high note. What we are highly likely to see shortly is the wireless charging case for Apple’s AirPods. Almost certainly this is going to be available an accessory for current AirPod owners, and included with new AirPods in the future. Apple may well be timing the release to coincide with the launch of its next generation of AirPods - but we’ll save that for another day. see, you don't understand that this isn't just about charging. That's the easy way Samsung takes as usual. You should have watched the demo of AirPower first.